Here's custom work you won't see too often. No EVH Frankenstein or SRV 'Number One' clones for this creative DIY'er! 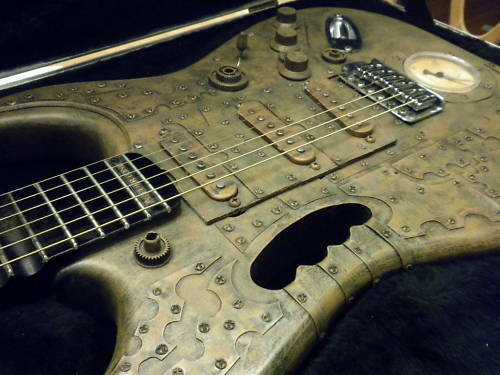 Dubbed the Aethertone AE1, this Steampunk style guitar is actually an '89 Fender Stratocaster that was modified so that the entire body appears to be wrapped in burnished metal plates. A tribute to Victorian-era steam engines, the plates, according to the seller, are not really metal. And neither are the 150 painted-on screws that seemingly hold the plates in place! 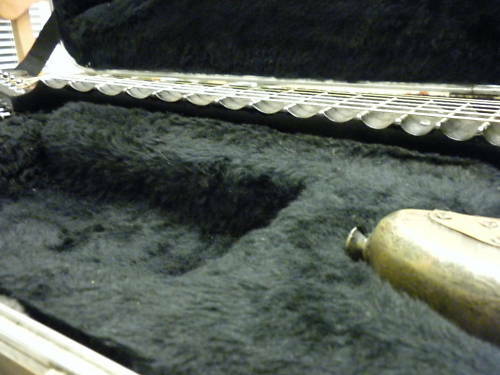 The Steampunk even features its own steam pressure gauge that opens up to reveal a secret compartment to store picks! And check out that deeply scalloped fretboard! It wouldn't surprise me if the Fender Custom Shop starts knocking on the door of the Aethertone AE1's creator very soon. 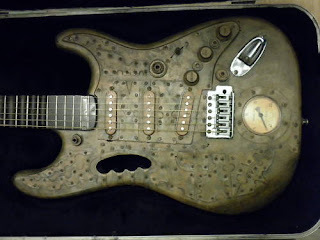 Reminds me of those machine gun shaped guitars used by alice cooper. Wonder who'd want to buy something so grotesque at such glorified prices. Hahaa! I happened to run into that one as well! I do think we're gonna see an increase of Steampunk stuff. Cool comments you's guys. BTW, I made this one, and I've since sold more of them, also did a Les Paul this way. It's art to those who appreciate it. Too cool! You're doing some very interesting work and I would love to see one up close. Joe Satriani | Birthday Tribute!